Upon arrival at Bluefields Bay, off the beaten path on the southwest coast, we discovered that it happened to be Jamaica's Independence Day. The celebration amongst the Jamaican people was non-stop. The constant drive and beat of their island music pervaded the air day and night. With joy, excitement, and dance, they played together on their gorgeous beaches, which they love! We were quite moved and wanted to join them. Hal paints to Reggae, and certainly the feeling of all of these rhythmic sounds and movement is reflected in his limited edition, mixed media work entitled, "Kay-ya-ya Beach" ! The canopy of this huge cottonwood tree was at eye level with our cottage facing West and overlooking vast Bluefields Bay. Every morning we would hike down the slope for a soothing wake up dip in the crystalline waters. Hal was so taken with the majestic cottonwood tree, outside our open veranda doors, that he painted it right on the spot. The title is "Lively Up Your Day," and it commemorates this island's lush beauty and its beloved music which Bob Marley so incredibly and rhythmically personifies. 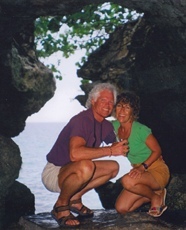 & "Lively Up Your Day - Bluefields Bay"
On a side trip with our friends we experienced the caves and cliffs near the diving lure of Negril. Before expressing a new environment Hal likes to explore many facets of the location. -- our knee caps are still smokin'!